Network and application performance degradation are a daily occurrence for most companies and IT teams don’t often realize the sheer size of the operational losses caused by performance degradation. 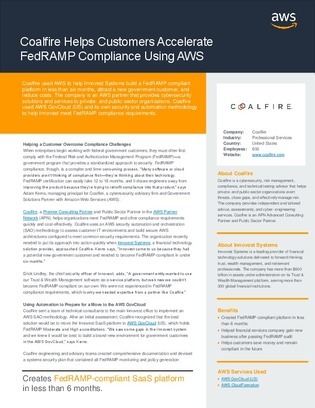 This case study explores how one financial technology provider became FedRAMP assessment ready in just six months—versus the traditional 12-18 months, with the help of Coalfire and AWS. Also learn how to evaluate the ROI for a network and application performance monitoring tool.